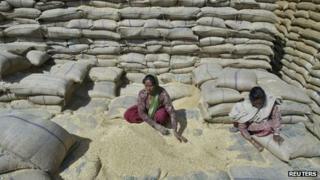 India's upper house of parliament has approved an ambitious plan to subsidise food for two-thirds of the population. The Food Security Bill proposes to make food a legal right and seeks to provide 5kg of grain every month to some 800 million poor people. The bill proposes to provide a kilo of rice at three rupees (six cents; four pence), wheat at two rupees and millet at one rupee. Millions live below the poverty line and many children are malnourished. The scheme is likely to cost 1.3 trillion rupees ($19.7bn; £12.6bn) every year. The lower house of parliament passed the controversial bill last month. It will now go to President Pranab Mukherjee for approval to become law. The bill was passed after a long debate in the upper house with the opposition criticising the government for "repackaging some existing schemes" with an eye on general elections next year. Food Minister KV Thomas said the federal government and the states "will have to work hand-in-hand" to make the scheme a success, and that the government would bear the major part of the expenses. India accounts for a third of the world's poor and supporters say such assistance will help reduce poverty and hunger. The bill was an election promise made by the governing Congress party and its implementation is expected to help the party in the elections. But it has had a rocky journey through the legislative process. In July, the cabinet passed the measure as an ordinance using special constitutional powers to enable Mr Mukherjee temporarily to sign it into law. But parliamentary approval was needed before 6 September - when the current session of parliament ends - for it to remain lawful. Is India's food security bill the magic pill?